I am an Amy Winehouse fan. I'm a little tired of her buzz track 'Rehab', the first single from her latest album, because even though it's in the Top 10 currently, it's been in circulation much longer than the album. But Back To Black is great from start to finish, so there are plenty of other reasons to like her, too. The third single from Back To Black is 'Tears dry on their own', a spunky Motown-inspired lost-love-survivor song filtered through Winehouse's gritty northern soul sensibilities. I am struck by the lyrics that begin the second verse: 'I don’t understand / Why do I stress a man? / When there’s so many better things at hand / We could've never had it all'. Stress a man. It's a slightly unusual turn of phrase, but I'd heard it before this. In my parents modest but eclectic record collection is one of Eydie Gorme's albums from the sixties (before she morphed into the caricature of a bawdy Las Vegas relic most people view her as today.) Don't Go To Strangers is, like many of her albums, a collection of traditional pop standards and show stoppers from Broadway musicals, and she gives powerful but nuanced readings of them. You can decide for yourself the answer to the first question. Since for me the answer is 'yes', off I go to see if I can answer the second one. 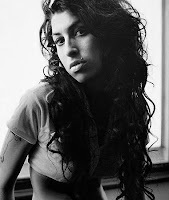 Many influences are attributed to Amy Winehouse. Besides the obvious Motown references are the torchy standard singers like Sarah Vaughan, Ella Fitzgerald, Dinah Washington and Etta James. But none of these women made a preserved recording of 'If he walked into my life'. 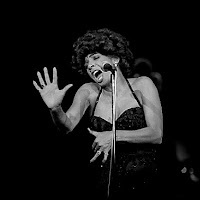 However, another torchy, slightly less standard singer did: Shirley Bassey. I can see from a recent compilation that Bassey recorded 'If he walked into my life' in 1968, but I can't trace it to an album (she released three in 1968, but none of them list the track) or determine if it was a single; it doesn't seem to have charted. Shirley Bassey is Welsh, and enjoyed considerably more success in the UK than she did here in the United States ('Goldfinger' aside.) Amy Winehouse is from North London, so I would say it's very likely that she has more than a passing familiarity with Shirley Bassey, and may have heard 'If he walked into my life' that way. Beyond that, it's hard to establish a connection between 'If he walked into my life' and Amy Winehouse. My investigation might have ended there. 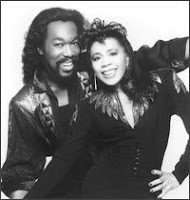 As hugely successful songwriters for the past five decades, Ashford & Simpson are undoubtedly familiar with standards like 'If he walked into my life'. So whether Amy Winehouse heard it in London or Ashford & Simpson heard it in the States, I can't say, but I'm quite confident that those lyrics were filtering around in the subconscious of somebody in the room when 'Tears dry on their own' was written.